Everyone is now onboard with flash. All the key storage vendors have at least announced entry into the all-flash storage array market, with most having offered hybrids — solid-state drive-pumped traditional arrays — for years. As silicon storage gets cheaper and denser, it seems inevitable that data centers will migrate from spinning disks to “faster, better and cheaper” options, with non-volatile memory poised to be the long-term winner. How much performance is needed, and how many workloads in the data center have data with varying quality of service (QoS) requirements or data that ages out? Are hybrid arrays a better choice to handle mixed workloads through advanced QoS and auto-tiering features? All-flash proponents argue that cost and capacity will continue to drop for flash compared to hard disk drives (HDDs), and that no workload is left wanting with the ability of all-flash to service all I/Os at top performance. Yet we see a new category of hybrids on the market that are designed for flash-level performance and then fold in multiple tiers of colder storage. The argument there is that data isn’t all the same and its value changes over its lifetime. Why store older, un-accessed data on a top tier when there are cheaper, capacity-oriented tiers available? It’s misleading to lump together hybrids that are traditional arrays with solid-state drives (SSDs) added and the new hybrids that might be one step evolved past all-flash arrays. And it can get even more confusing when the old arrays get stuffed with nothing but flash and are positioned as all-flash products. To differentiate, some industry wags like to use the term “flash-first” to describe newer-generation products purpose-built for flash speeds. That still could cause some confusion when considering both hybrids and all-flash designs. It may be more accurate to call the flash-first hybrids “flash-converged.” By being flash-converged, you can expect to buy one of these new hybrids with nothing but flash inside and get all-flash performance. 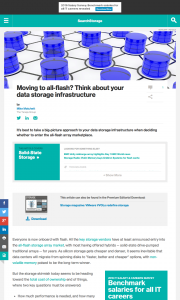 This entry was posted in Published Articles and tagged Flash, SearchStorage, Storage, Storage magazine, Taneja Group by Mike. Bookmark the permalink.